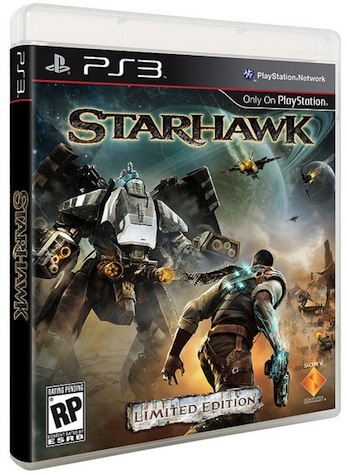 Starhawk released today exclusively for the Playstation 3! Starhawk is a third-person shooter with a setting that reminds us of Firefly — that wild west in space vibe. It’s the future, and Humans have colonized other planets. The game takes place in a colony aptly named ‘Frontier’ where miners have been affected by a powerful substance known as rift energy. This energy has transformed some of the miners into mutants who are protective of the rift energy, and the natural conflict for game is established. but for now we’ll say that the single-player feels very similar to multiplayer in that the player is given multiple ways to tackle a problem. Multiplayer is the heart and soul of Starhawk. Players can compete in 16v16 matches of CTF, zone control, and other common multiplayer modes. These maps are ginormous to accommodate Hawks, the mechwarrior/transformer/Warhawk machines that define the gameplay in Starhawk. The gameplay hasn’t changed much from the Warhawk days; Players fly around in highly maneuverable Hawks, on the ground in tanks and vehicles, or on foot with a very familiar multiplayer shooter feel. Build & Battle is what makes Starhawk unique. As you play you earn rift energy that you can spend like currency to call in drops from the radial Build & Battle menu. You can call in walls, turrets, supply depots, vehicle bays, and change the course of battle through strategically utilizing rift energy to give you and your team the advantage. Read on for more of our review! In an awesome launch day announcement, the Starhawk team declared that all map packs will be FREE! Back in the Warhawk days, we saw a lot of division amongst our players whenever we’d release a new set of maps. Some people would have them, some wouldn’t, and it ended up fracturing our community. But during the Starhawk development cycle, the teams at Sony and LightBox sat down with the intention of addressing this problem in the most simple and elegant way possible. And that led to our decision that any future map pack releases would be offered for free, to keep players together and keep our community happy. Paid maps are one of the main reasons we stop playing games like Call of Duty. If we don’t buy the map pack, we have this psychological impairment telling us that we’re not playing the game to its fullest. We have a couple complaints about the game so far. First, the load times are absolutely atrocious. It takes forever to load a map, and our PS3 even locked up once while loading. Second, we experienced a lot of slowdown when playing split-screen online multiplayer which is likely being caused by the game being rendered twice. It wasn’t unplayable, but it was bad at times. Starhawk is one of the better PS3 exclusives we’ve played. They’ve improved a lot from Warhawk and given us several reasons to wish this was available on other platforms. The Build & Battle system makes matches even more dynamic by putting base construction in the players’ hands, the ‘feel’ of the game makes playing effortless, gameplay is constant action, and nothing else out there feels as good as flying a Hawk. We give Starhawk a solid 4.5/5. Thanks for the review guys. Wish I had a ps3. Added the video to the blog post.